As Congress returns to Washington from the month-long August recess, sources are telling POLITICO that Speaker John Boehner and House Financial Services Chairman Jeb Hensarling (TX-5) have a private agreement to act on a short-term reauthorization of the government-sponsored international trade finance bank. Supporters of the bank trying to sway Hensarling say that it provides essential tools for international trade, and note that in Texas, over 1,500 companies have used the Ex-Im Bank since 2007, supporting over $24 billion in exports. That’s more than any other state. The Ex-Im Bank also turns a profit. It transferred over $1 billion to the U.S. Treasury in fiscal year 2013. Hensarling said that the good times won’t last forever. “Fannie and Freddie didn’t run a deficit, until they did. The federal Pension Benefit Guaranty Corp. never ran a deficit until it did,” he told The News’ Michael Lindenberger in July. Hensarling has also questioned whether the bank is a boon for small businesses. Over 70 percent of the companies that used the bank in 2013 were small businesses. But they accounted for less than 20 percent of the total assistance it authorized. Big companies such as Boeing and Caterpillar used the rest. Conservative groups such as the Club for Growth and the Heritage Foundation have joined Hensarling in criticizing the bank. If Hensarling is unwilling to make a deal, House leadership could potentially override him. But that looks unlikely. New House Majority Leader Kevin McCarthy and House Majority Whip Steve Scalise also oppose renewing the bank. McCarthy could stop a bill to extend the bank’s charter from reaching the House floor. Special interests, such as the US Chamber of Commerce are furious with McCarthy, claiming he is “appeasing the Tea Party” by reversing his stance on Ex-Im. "Kevin saw what happened to Cantor," California businessman Don Nelson of Bakersfield, California said of former Majority Leader Eric Cantor, who lost to a Tea Party backed candidate in his district's primary election. The surprise outcome, many analysts believe, sent a message to establishment Republicans that the Tea Party is still very much alive claimed McCarthy’s hometown newspaper, The Bakersfield Californian. After Majority Leader McCarty adopted the conservative position on the Ex-Im Bank businessman Nelson now questions whether McCarthy is still a traditional Chamber of Commerce Republican. And that, from our perspective, is a good thing. 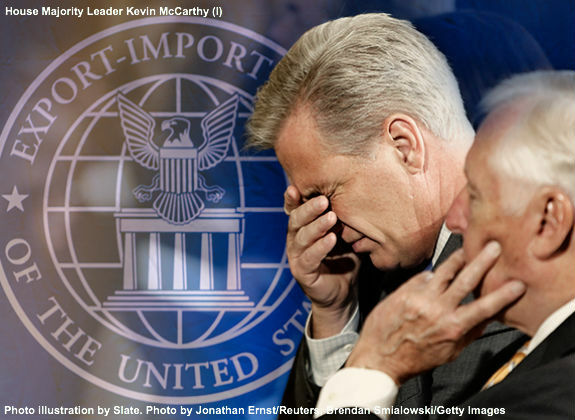 Call the Capital Switchboard (1-866-220-0044, toll-free) and tell House Majority Leader Kevin McCarthy to oppose reauthorization of the Export-Import Bank and sign our petition.